Over the next few nights, Sikhs all over the world will be heading to their Gurdwaras or joining in sangat to remember the lives, bravery, and martyrdom of the chotay sahibzadey. In our household, this has taken on extra meaning this year, as the recent blockbuster film Chaar Sahibzaadey has brought the personality of Guru Gobind Singh Ji’s sons to life and inspired us all. I have closely followed the discussion of the film and even some of the debate…in particular, the portrayal of Mata Gujri Ji. Now this is not a critique of the film, but an attempt to engage in a broader dialogue. Over the years teaching Sikh history to children, I’ve struggled with the story of Mata Guri Ji. When I read history, I see Mata Gujri Ji along with Guru Tegh Bahadur Sahib as the ones who shaped young Gobind Rai, the warrior-poet, who would ultimately become the father of the Khalsa. And even with the difficult circumstances after Guru Tegh Bahadur’s shaheedi, Mata Gujri Ji played a critical role in managing affairs of the panth and inspired the soldiers at the Battle of Bhangani. She also played an instrumental role in the training and upbringing of her grandsons. And when Mata Gujri Ji and the chotay sahibzadey were held captive in the thanda burj for days, it was she who recited baani for them and inspired them through stories of their grandfather, father, and gurus before them. 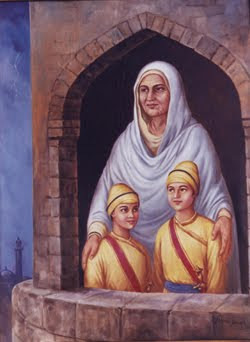 It was she who motivated them to remain firm in their faith, so much so that when the entire fate of the khalsa panth rested on their shoulders – a 7 and 9 year old – they responded fearlessly, with such courage and bravery that they continue to inspire the Sikh nation 300 years later. So when the worried Mata Gujri Ji, upon learning of the execution of her grandsons, is so overcome with emotion that she faints and dies…it gives me pause. There is a part of me that appreciates the movie’s portrayal of Mata Gurji Ji. After all, she was a human being who suffered incredible losses. Humans are complex and it’s perfectly reasonable that she can be the stoic matriarch, yet still feel pain and sadness. But there’s also a part of me that thinks something else…maybe we have it wrong. In one of the debates over Facebook on the portrayal of Mata Gujri Ji in the film, a friend said “You have to know true Gursikhs in order to portray them.” This thought resonated with me and made me reflect. As human beings, our perceptions of things are bounded by our knowledge. And more so than our knowledge…our experiences. Sikh history is no different; we can connect with it only as far as our boundaries will take us. So perhaps as educators, storytellers, and filmmakers…our experiences have limited us. In my pre-teen years, when I was exposed to the rehat maryada for the first time, I couldn’t imagine Sikhs actually living this discipline “to the letter.” I could only picture images in my head of the “puratan singhs” who lived like this. And so I would dismiss the rehat, calling it “outdated” and more of a “guideline” than a code. But then I ventured out of my circle, and I met Gursikhs who lived this discipline – to the letter – from waking up at amritvela, engrossed in simran, reciting baani, and interacting with others with such love that you knew you were in the company of guru-centered Sikhs. After this experience, this “ideal” image of the Sikh all of a sudden didn’t feel so distant. Sometimes I reflect on the torture of Bhai Sati Daas, Bhai Mati Das and Bhai Dayala Ji at the hands of Aurangzeb and it’s incomprehensible. But after speaking to Singhs who withstood horrific torture by the hands of the Indian State in the 80’s and 90’s, my perspective sharpens and I look at stories of shaheedi throughout our history with a different lens. It all feels much closer. And when I listen to the accounts of mothers throughout the 80’s and 90’s whose fathers, husbands, and sons were taken or murdered before their eyes and they live on to speak with courage and remain in the chardi kalaa, I think to myself…that is Mata Gujri Ji. So the lesson I’ve taken from this is simple, in fact it’s one my Guru tells me multiple times a day…be in the company of Gursikhs. It will expand my boundaries. It will not only help me connect with my Guru, but also connect me with my history in a way I never have before. Board meetings at the Sikh Coalition are intense. The needs are many, the resources are few, and there’s plenty of debate (often heated) on how best to serve the community, to move the panth forward, and to realize the civil and human rights of all people. Earlier this year around Vasakhi, when we met in New York City for our annual planning, we landed on our agenda topic titled “1984 – 30 Years.” But this topic was unlike any others we discussed that day. There was no debate, no arguments…but instead a collective commitment to make this the most impactful program of the year. Over the next few weeks, the entire Sikh Coalition team put together a plan to remember the 30th anniversary of 1984 around the themes of Educate, Engage, & Inspire. As part of our media engagement efforts, the Sikh Coalition staff and advisory board authored the following articles. “Witnessing 1984” Panel Discussion – a panel discussion on the Sikh experiences and events of 1984. 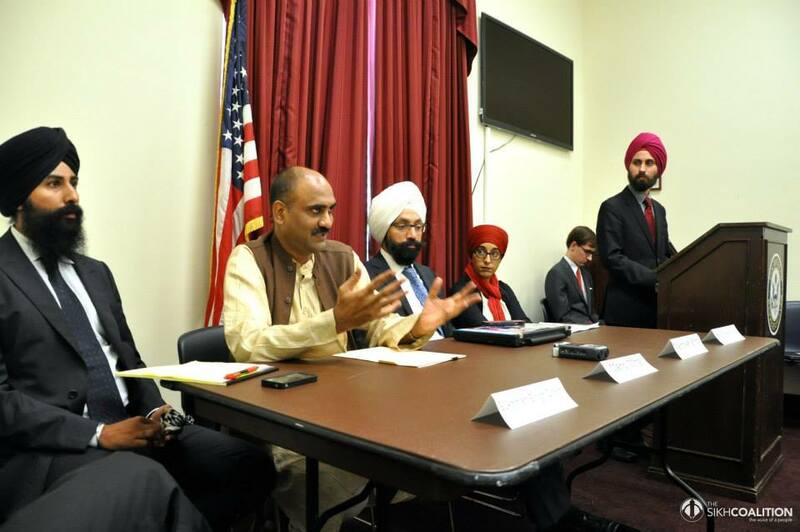 Three community members shared their experiences in in our New York City office about living through the attack on Darbar Sahib in June and the pogroms of November 1984. “From 1984 to Gujarat” Book Discussions with Author Manoj Mitta – Book discussions were held with author, journalist, and human rights activist Manoj Mitta at George Washington University, Columbia University, and the Sikh Coalition’s NYC office. Mr. Mitta spoke about his two groundbreaking books on human rights abuses in India: When a Tree Shook Delhi: The 1984 Carnage and Its Aftermath and The Fiction of Fact-Finding: Modi and Godhra. Kultar’s Mime – On Saturday, January 24th, The Sikh Coalition will host a showing of Kultar’s Mime in Washington DC followed by a panel discussion for Capitol Hill staffers, human rights organizations, and partners. Kultar’s Mime is a play based on a poem describing the sufferings of the Sikhs of Delhi after the pogroms, through the eyes of a group of young survivors. But of all the initiatives, the one that inspired me most was the ‘Connecting with 1984’ Small Grants Pool, where a group of committed donors offered $100,000 in small grants to individuals and/or groups to create and deliver educational and innovative programs to raise awareness within the Sikh community about the events of 1984. Over the last 6 months, the Sikh Coalition has awarded grants for projects such as children’s books, plays, open mic events, workshops, conferences, and archive projects. As I’ve written about before on this blog, 30 years marks a new generation of Sikhs who will grow up learning about 1984 with little direct connection. And we must decide how that story will be told…a tale of “loss and destruction” or of “courage and inspiration.” The small grants pool has enabled and empowered so many to find their voice and create innovative ways to craft the narrative of 1984 for generations to come. Even with all these initiatives, many will criticize that we haven’t done enough. No one at the Sikh Coalition would disagree. But I take comfort in knowing that I work with a team where each and every individual has been moved and inspired by the events and personalities of 1984…and knowing the work does not stop here – collectively, we will not let this moment in history pass quietly. If this work means something to you…please consider making a donation to the Sikh Coalition. I’ve made a personal commitment to raise $10,000 so that that this type of programming and similar work can continue in n 2015. I hope I can count on your support.